Mr. Schehr is the Director of Dykema’s Financial Industry Group. 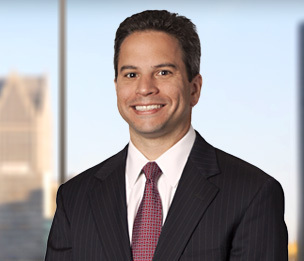 He represents clients in complex litigation, including financial services, shareholder, contract, real estate, trade secret, and health care disputes. Mr. Schehr argued and won two significant cases for the financial services industry: Residential Funding Co., LLC v. Saurman, 490 Mich. 909 (2011), where the Michigan Supreme Court reversed a Court of Appeals decision holding that tens of thousands of foreclosures by advertisement conducted by Mortgage Electronic Registration Systems, Inc. were void ab initio; and Conlin v. Mortgage Electronic Registration Systems, Inc., 714 F.3d 355 (6th Cir. 2013), where the Sixth Circuit affirmed dismissal of claims of robo-signing and fraud and upheld a contested foreclosure. He has also handled complex business litigation at trial and appellate levels of federal and state courts and in arbitration. Mr. Schehr is a Past President of the Eastern District of Michigan Chapter of the Federal Bar Association (2014-15). He has served as a court-appointed discovery master in federal cases and as a court-appointed expert for discovery issues in state court. He is a Certified Commercial Arbitrator for the American Arbitration Association. He has been recognized by several publications for outstanding legal practice, including The Best Lawyers in America©, Michigan Super Lawyers®, dbusiness Magazine and Leading Lawyers Network. He also served for seven years as one of Dykema’s Litigation Practice Group Leaders before becoming Director of Dykema’s Financial Industry Group. Before joining Dykema, Mr. Schehr served as a law clerk to the Honorable Avern Cohn, United States District Judge for the Eastern District of Michigan (1997-99). Ally Bank v. Lenox Fin. Mortg. Corp., 2018 U.S. Dist. LEXIS 4501 (D. Minn. 2018). Won summary judgment on claims of breach of contract and indemnity under correspondent lending agreements. United States v. Krasicky and PNC Bank, NA, 2016 U.S. Dist. LEXIS 42057 (E.D. Mich. 2016). Won dismissal of tax claims brought by Department of Justice. Smith v. Delta Funding Corp., 2016 U.S. Dist. LEXIS 16604 (E.D. Mich. 2016). Successful defense of putative consumer class action. Best v. Ocwen Loan Servicing LLC, 2016 U.S. Dist. LEXIS 3441 (E.D. Mich. 2016). Won dismissal of claims under the Real Estate Settlement Procedures Act, which was affirmed by Sixth Circuit. Ally Bank v. Bay-Valley Mortg. Group, 2015 U.S. Dist. LEXIS 191420 (D. Minn. 2015). Won summary judgment on breach of contract claim, and recovered attorneys’ fees under correspondent lending agreement. Lindberg v. Bank of Am., N.A., 2015 U.S. Dist. LEXIS 151551 (W.D. Mich. 2015). Obtained dismissal of RICO claim. Johnson v. Mortg. Elec. Registration Sys., 2014 U.S. Dist. LEXIS 164761 (E.D. Mich. 2014). Obtained dismissal of claims involving the Servicemembers Civil Relief Act. Cohen v. Schonsheck, 2014 U.S. Dist. LEXIS 34798 (E.D. Mich. 2014). Won appeal from bankruptcy court in business dispute. Connolly v. Deutsche Bank National Trust Co., 581 Fed. Appx. 500 (6th Cir. 2014). Won appeal involving claims of wrongful foreclosure and slander of title. Khoshiko v. Deutsche Bank Trust Co. Ams., 574 Fed. Appx. 539 (6th Cir. 2014). Won appeal regarding claim that borrower was entitled to a loan modification under Michigan law. Nahabedian v. OneWest Bank, FSB, 556 Fed. Appx. 389 (6th Cir. 2014). Prevailed on appeal involving probate exception to federal jurisdiction. Thill v. Ocwen Loan Servicing, LLC, 8 F. Supp. 3d 950 (E.D. Mich. 2014). Obtained dismissal of breach of contract, tortious interference, fraud, conspiracy, and statutory claims. Conlin v. Mortgage Electronic Registration Systems, Inc., 714 F.3d 355, (6th Cir. 2013). Sixth Circuit affirmed dismissal of claims of robo-signing and fraud relating to an assignment of mortgage under Fed. R. Civ. P. 12(b)(6), which was a significant win for the financial services industry. Nora v. Residential Funding Co., LLC, 543 Fed. Appx. 601 (7th Cir 2013). Seventh Circuit affirmed dismissal under Rooker-Feldman doctrine. Authorized Integrators Network, LLC v. Wirepath Home Sys., LLC, 2013 WL 3179505 (E.D. Mich. 2013). Obtained denial of motion to dismiss in breach of contract and indemnity case. Wyandotte Professional Bldg., LLC v. KeyBank, N.A., 2013 WL 5449786 (E.D. Mich. 2013). Obtained dismissal of claims for defamation and negligence regarding commercial loan. Lowry Holding Company, Inc. v. Geroco Tech Holding Corp., 2012 WL 1890231 (Mich. App. 2012). Won dismissal of claims under Michigan's Uniform Trade Secrets Act and for breach of contract and tortious interference with a business relationship, which was affirmed by Michigan Court of Appeals. Collins v. Wickersham, 862 F.Supp.2d 649 (E.D. Mich. 2012). Won dismissal of putative class action asserting claims of wrongful foreclosure and violations of the Real Estate Settlement Procedures Act. Awad v. General Motors Acceptance Corp., 2012 WL 1415166 (Mich. App. 2012). Michigan Court of Appeals affirmed dismissal of complaint contesting foreclosure after expiration of redemption period based on lack of standing. Schare v. Mortgage Electronic Registration Systems, Inc., 2012 WL 2031958 (E.D. Mich. 2012). Won dismissal of putative class action asserting claims of wrongful foreclosure. Residential Funding Co. v. Saurman, 490 Mich. 909 (2011). Michigan Supreme Court reversed a Court of Appeals decision holding that tens of thousands of foreclosures by advertisement conducted by Mortgage Electronic Registration Systems, Inc. were void ab initio. Armstead v. Diederich, et al., 2011 WL 2936802 (Mich. App. 2011). Michigan Court of Appeals affirmed dismissal of physician's complaint against major hospital system, finding Michigan's peer review statutes and federal Health Care Quality Improvement Act barred claims. Mekani v. Homecomings Financial, LLC, 752 F.Supp.2d 785 (E.D. Mich. 2010). Successful defense of lender on claims under Real Estate Settlement Procedures Act and Fair Housing Act. BP Products North America Inc. v. Canton Holdings, LLC, 2009 WL 2605359 (Mich. App. 2009). Michigan Court of Appeals affirmed permanent injunction issued after bench trial for enforcing deed restriction on real property. Thielen v. GMAC Mortgage Corp., 671 F.Supp.2d 947 (E.D. Mich. 2009). Obtained dismissal of claims under Truth In Lending Act and Home Ownership and Equity Protection Act. Barkho v. Homecomings Financial, LLC, 657 F.Supp.2d 857 (E.D. Mich. 2009). Successful defense of lender on claims under Truth In Lending Act, Home Ownership and Equity Protection Act, Fair Credit Reporting Act, and usury statute. Hanning v. Homecomings Financial Network, Inc., 436 F. Supp. 2d 865 (W.D. Mich. 2006). Obtained summary judgment regarding claims of fraud and usury concerning a loan transaction. BP Products North America Inc. v. Haidar Van Dyke, LLC, 408 F. Supp. 2d 323 (E.D. Mich. 2005). Won judgment for oil company in breach of contract and real estate dispute regarding the enforceability of a use restriction. Dedvukaj v. Equilon Enterprises, LLC, 132 Fed. Appx. 582 (6th Cir. 2005), affirming 301 F. Supp. 2d 664 (E.D. Mich. 2004). Successfully defended oil company against claims brought under contract and the Petroleum Marketing Practices Act. Wilson v. Homecomings Financial Network, Inc., 407 F.Supp.2d 893 (N.D. Ohio 2005). Obtained dismissal of usury claim. Mills v. EquiCredit Corp., 294 F. Supp. 2d 903 (E.D. Mich. 2003); 344 F. Supp. 2d 1071 (E.D. Mich. 2004); affirmed, 2006 WL 455158 (6th Cir. 2006). Represented lender in case involving a question of first impression under Michigan's Consumer Protection Act. Federal district court issued first published decision finding lender exempt under the Michigan Consumer Protection Act. Summary judgment in favor of lender was affirmed by Sixth Circuit. Worthy v. World Wide Financial Services, Inc., et al., 347 F. Supp. 2d 502 (E.D. Mich. 2004); affirmed, 2006 WL 2188931 (6th Cir. 2006). Successfully defended claims under Truth in Lending Act and Bankruptcy Code. "Borrowers' Challenges to Loan Modification Procedures and the Exclusive Statutory Remedy"